If you’ve been waiting for the perfect opportunity to learn how to design iOS apps, then congratulations: That perfect opportunity is right here, right now. With The Name Your Own Price iOS Designer Bundle at Cult of Mac Deals, you could get up to 4 elite-level instructional courses and 3 design element packs that’ll prepare and equip you to design top-of-the-line and engaging iOS applications. As the name of the deal suggests, you decide what you want to pay to get two courses: ‘Learn Mobile First: Web Design Using Bootstrap’ and ‘The Art Of App Design & Marketing’. Both of these courses will help lay the foundation of knowledge you will need to be a success later. These two courses are worth their weight in gold, but you could get them for whatever you want to pay. If you choose to ‘Beat the Average’ price paid for those two courses, you’ll get the whole bundle. That’s 4 complete, top-level courses as well as 3 designer asset packs that will set you down the right path to becoming an iOS development professional in no time. If there was any doubt left that this is the right iOS developer bundle to pounce on, you can rest easy knowing that, when you purchase The Name Your Own Price iOS Designer Bundle, 10% of what you agree to spend will be sent to your choice of one of three worthy charities. Cult of Mac Deals has selected the charities Child’s Play, World Wildlife Fund, and Creative Commons to benefit from this promotion because they make a constant and positive contribution to the entire globe. The Name Your Own Price iOS Designer Bundle, which includes 4 elite courses and 3 design element packs, will prepare you to become a top iOS developer. The bundle has a value of over $1400, but could be yours for much less than that. The best opportunity to learn how to design iOS apps is right here, right now. 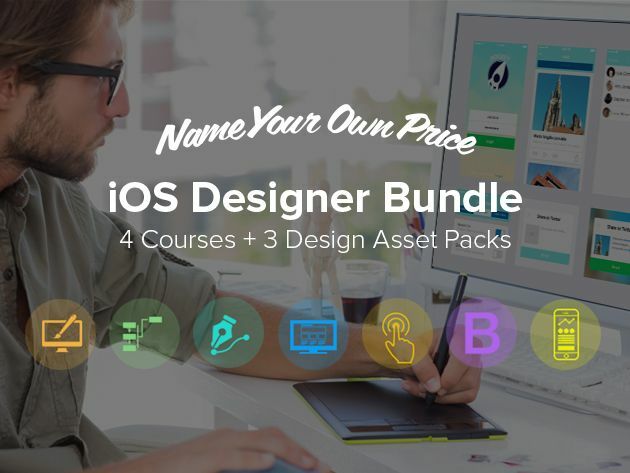 Purchase The Name Your Own Price iOS Designer Bundle at Cult of Mac Deals today.